When I started Italy Perfect nearly 16 years ago it was because I wanted an excuse to be able to go to Italy as often as possible. Rome is my second home. I lived in the Eternal City for many years in my youth, and even though our vacation rental business brings me to Rome several times a year, I’m there to work, not play. You know how it is; you never actually take a real vacation in your hometown. It’s hard to believe, but until my recent staycation, I hadn’t been inside the Coliseum in over 30 years, and my last Vatican Museum visit was in 1999. I’ve been too busy sharing Rome sightseeing tips rather than using them! Our family’s Rome trip was one of our best ever! 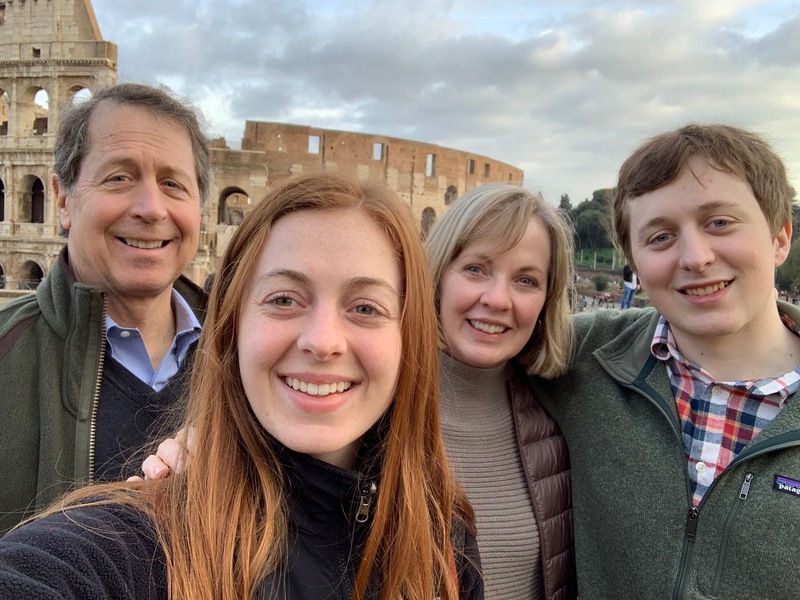 This past holiday season I celebrated Christmas in Rome with my husband and two adult children, showing them “my” Rome, sharing with them many special places and memories. Enjoying one of my favorite cities with my family gave me a new perspective on the city and made for one of our best family vacations ever! Do only one “big” activity per day. For example, don’t try to see the Vatican and the Coliseum in one day. Schedule ample time for great meals and book popular restaurants ahead. They are not necessarily full, but you can’t always rely on what days they will be open. For example, we had to make two trips to a favorite out-of-the-way restaurant not realizing it was closed on Sundays. Factor in enough down time. The lazy time turned out to be one of the best bonuses of the trip. With my kids now in their 20s, they have other pursuits. So, just spending time together as a family was a real treat, not just for sightseeing, but with ample casual time to relax in the apartment, too. 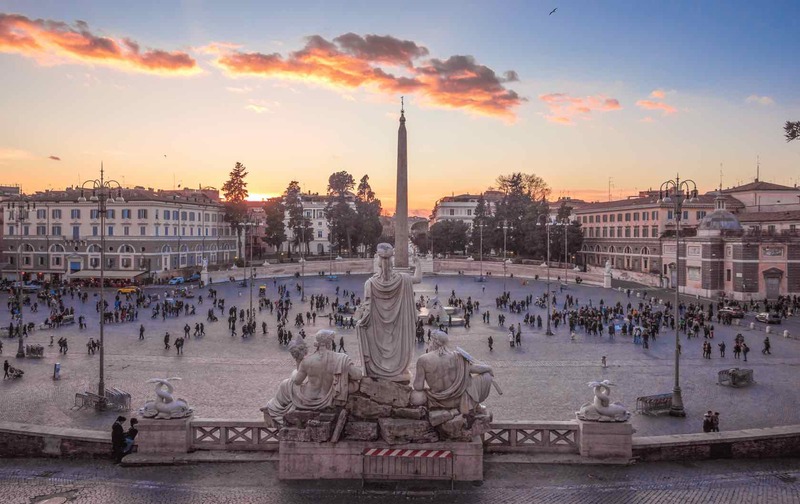 Piazza del Popolo is one of Rome’s most picturesque squares. Some of the less structured activities were our favorites, like hanging out in Piazza del Popolo watching the bubble guy and listening to singers (we lost count of how many times we heard the same performer sing a popular Ed Sheeran song), long walks in the Borghese Gardens away from the crowds, impromptu take-out pizza back at the Flaminio apartment which was our home base and laughing together at crazy Italian TV game shows, with me translating for the family. Day 1: After an all-night flight, I took the family on an orientation walk. Piazza del Popolo, Via del Corso, quick preview of the Pantheon and Piazza Navona on the way to lunch in Piazza di Pasquino, where I have several favorite restaurants because our Pasquino apartment is on the piazza. I’ve gotten to know some of the waiters who welcome me back like a long lost cousin. After lunch, the Welcome to Rome 3-D movie animation is just around the corner. It’s a great overview of how ancient Rome once looked and a good briefing in advance of next day’s agenda. Day 2: Visit the Coliseum and Roman Forum. We split it up with the Coliseum in the morning, a nice lunch nearby and then back to the Forum in the afternoon. My son, a Roman history buff, wished he’d had more time in the Forum. See our 5 Rome Sites to Book Ahead blog for how to book tickets. 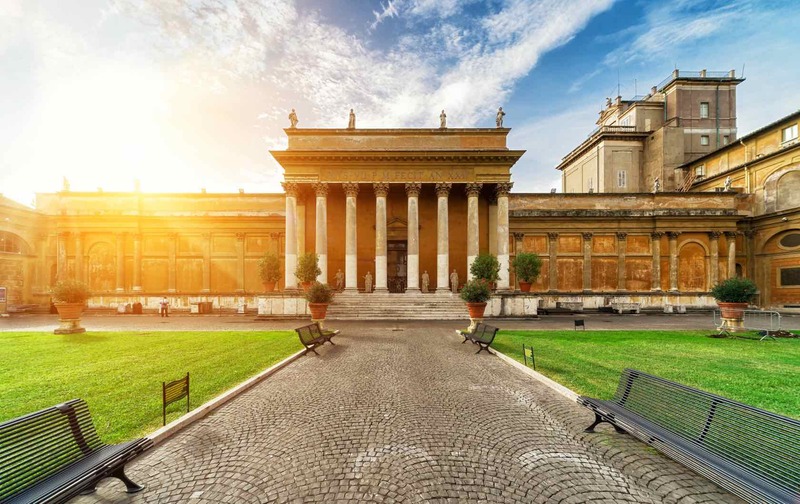 Visit the Vatican Museums, but book ahead! Day 3: Wander around Piazza Navona and Campo de’ Fiori. While there, check out as many Caravaggio’s as possible per our Every Caravaggio and Amazing Caravaggio blogs. Visit the Pantheon and lunch at an excellent fish restaurant, La Rosetta, followed by gelato at Giolitti. Day 4: Stroll along Via Veneto, recounting tales of my youth when the Via Veneto was the epicenter of the “La Dolce Vita” era, with swank cafes, movie stars, Federico Fellini sightings, designer shops and where, as a teenager, my best friend and I worked for a summer as house models at a fashion boutique (It’s not as impressive as it sounds: six days a week that began with cleaning store windows, vacuuming, then hair and make up for two fashion shows each day, with lunch in between. There was hanging out a Cafe de Paris– well, that part was glamorous –and doing errands for the owner, like going to post office or hardware store–definitely not glamorous). Onward to the Santa Maria della Concezione dei Cappuccini, better known as the “Church of Bones,” the creepiest church you’ll find in Rome and maybe anywhere. 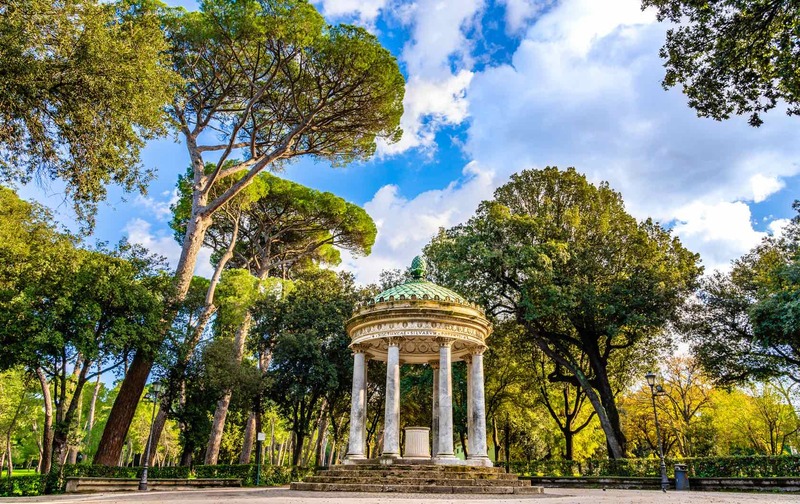 The Borghese Gardens are beautiful any time of year. Day 5: Visit to Galleria Borghese followed by lunch at Trattoria Vecchia Roma for the tastiest Bucatini alla Amatriciana pasta. This was the out-of-the-way restaurant that was closed the first time we tried to go; I should have thought to call ahead. It was worth the second trip. The family is still dreaming about the pasta tossed in a giant wheel of pecorino cheese! Day 6: Leisurely day, with a long walk in the Borghese Gardens, and a Christmas dinner at a terrific restaurant. Most good restaurants are closed on Christmas Day, but my Roman friends tipped me off on where to go. 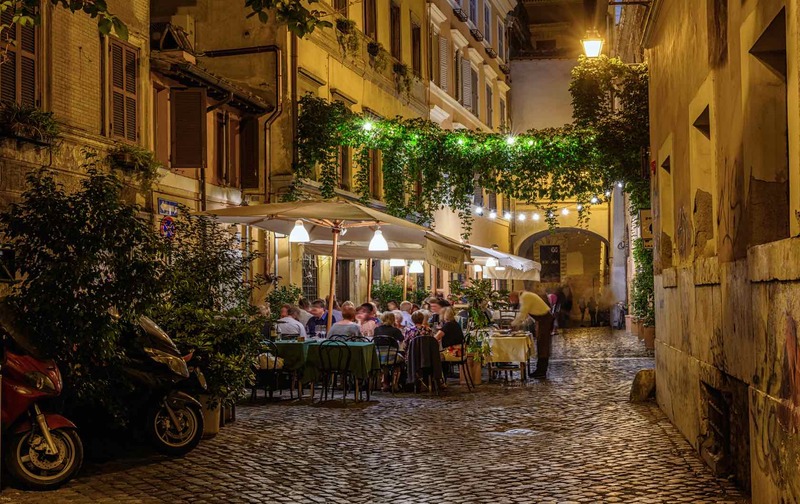 Trastevere is a marvelous area to explore. Day 7: Museo Valentini Domus Romane was probably the family’s favorite activity: timeless Gregorian chants at Sant’Anselmo’s Vespers right by the famous keyhole view of St. Peter’s. This was followed by dinner and a leisurely wander around the Trastevere neighborhood. Day 8: Visit to St Peter’s cathedral, revisiting favorite spots in the Prati district, lunch at Dal Toscano (Myhusband was very happy for bistecca alla Fiorentina! ), followed by the Vatican Museums, Sistine Chapel and Saint Peter’s Basilica in the afternoon. A last-minute trip to Pompeii didn’t disappoint. Day 9: This was meant to be a free day to relax (mother-daughter purse and shoe shopping). However, my enthusiastic family decided the previous evening that Pompeii was essential, so we hopped on the train early in the morning and popped down to Pompeii for the day. It’s as easy as taking the high speed train down to Naples (just over an hour) and then the local Circumvesuviana train from Naples to Pompeii as in this blog. Had I planned this in advance, I would have bought skip-the-line tickets and splurged on a private driver to take us there and back. That would have been more relaxing then being crammed like sardines and standing for 40 minutes on the local Naples to Pompeii train. 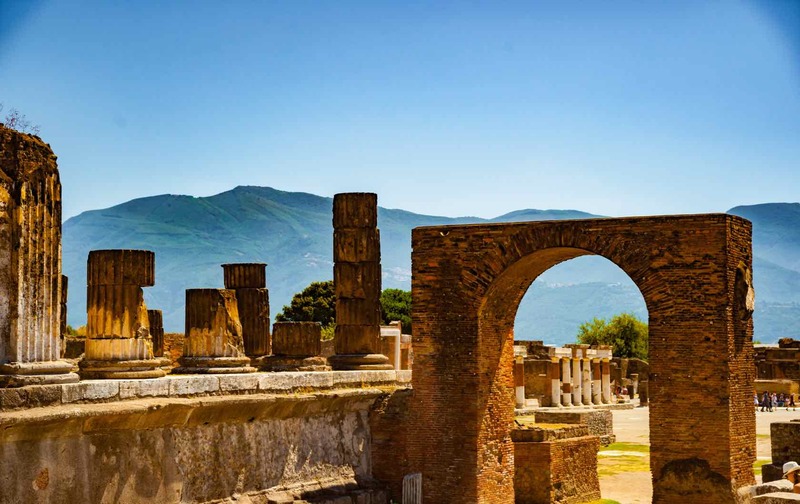 We could have easily spent one more day exploring Pompeii; there was so much to see. It was a long day, but totally worth it. It was a fantastic family vacation, and the whole family can’t wait to go back! I hope these Rome sightseeing tips will help make your family vacation just as wonderful as mine! Contact Italy Perfect at [email protected] or 1-888-308-6123, and our team can help you find the ideal Roman home base. Hi Jennifer – You must come with me some day!